All of us here at Pesky Cat Designs want to wish you and your family Happy Holidays and much peace, joy, love and health in the New Year. New Harris Tweed messengers are available at the Pesky Cat Designs. The one above has a sweet bird on a branch applique made from wool felt and a pretty cotton floral print interior. Wear it across the body messenger style or on your shoulder. All our Harris Tweed is imported directly from Scotland. Harris Tweed is a cloth that has been handwoven by the islanders at their homes in the Outer Hebrides of Scotland, using local wool. A new purse made from a Harris Tweed barleycorn weave in brown, tan and black was just added to the shop. Barleycorn tweeds have a prominent flecked pattern that give them a more richly textured appearance. The different colors merge together into a single shade from a distance. I love its raw and earthy look. Above is a selection of purses from the shop in Harris Tweed wool, linen blend upholstery and faux leather. Come see more at the Pesky Cat Designs shop! New purses have arrived to the Pesky Cat Designs shop! The selection above is made from faux suede, faux leather and Harris Tweed wool. Wishing you all a relaxing and enjoyable weekend! The Pesky Cat Designs studio is taking a little break. Other obligations are taking up most of our time right now. The shop is open for business but bag production has slowed for now. If you are interested in a custom order just contact me via the shop. Production time will now be 5 to 10 days. Wishing everyone a wonderful weekend. Enjoy! Vacation notice: All items purchased from the Pesky Cat Designs shop between October 7th and October 11th will ship Wednesday, October 12th. You will still be able to contact us if you have any questions. Thanks! Shop Update: Bags made from recycled leather are now available in the shop! More to come. Leather apparel sourced from a charitable thrift shop was deconstructed and then given a second life in my studio, transformed into this one-of-a-kind satchel. I'll be keeping my eye out for leather treasures to repurpose on my future excursions to thrift shops and consignment shops! Autumn has officially arrived here in northern Florida and so have some new fall-inspired bags. Even though I'm still wearing sandals and T-shirts, in the next couple of months it will get cooler. Last winter the fountain downtown grew some icicles so it can get pretty chilly. Just in time for autumn celebrations, I've added four new cross body bags to thePesky Cat Designs shop! And last but not least, my new tower of happiness. It holds 66 large spools and has made my life in the studio so much more pleasant. No more digging through my storage box to find the right thread! It's been a while since I posted a glimpse into my studio. This past Friday I was able to purchase some plastic storage bins and finally organize my space. The 90" long work table below was pretty much covered with various supplies, fabrics and finished bags leaving me very little space to actually work on. Now everything is in its place and I have finally regained my work space. It will make cutting fabric and drafting out patterns so much easier. Below is my sewing station complete with my trusty and reliable Juki. On the left is a glimpse of a Brother machine that I use for applique work. I purchased the chair for $10 dollars at a local second hand shop and reupholstered it with faux suede. It works perfect. Inspired by the latest color blocking trend, my new purses are created in blocks of velvet, chenille and corduroy. These bags are one-of-a-kind and now available at the Pesky Cat Designs shop. In the next several weeks I'll be working on re-stocking the shop with some of my staple bags such as the bird on a branch applique messenger bag. I plan to have a nice selection in time for the upcoming holiday season. This week in the studio I did some experimenting combining various Harris Tweed weaves to create a purse. This purse is also a new design measuring at approximately 14" wide, 8.5" high and 2.5" deep. Roomy enough to fit your daily essentials with a stream-lined design to fit comfortably under your arm. The purse above is made from Harris Tweed wool in two plain weaves and a barleycorn weave. I love the contrasting colors and textures. Back view of purses above. And last but not least, a basket/tote design, using a lovely blue Harris Tweed plain weave and a Macleod check. All these new bags are now available at the Pesky Cat Designs shop. Wishing everyone a great weekend ahead! Just added a couple of one-of-a-kind Harris Tweed patchwork bags to the Pesky Cat Designs shop. It will be the perfect bag to pair up with your favorite fall or winter coat and add a pop of color to your day. To create the flap I cut out squares of Harris Tweed wool and interface each piece. Then I play around arranging the different colors and patterns. That's the most fun part. When I am satisfied with the result I begin to sew them together. And that is how the patchwork flap evolves. Wishing everyone a wonderful weekend ahead. Enjoy! This week I spent some of my time in the studio creating birthday gifts for two dear friends. One friend only uses backpacks since she has trouble with her shoulders so I designed the bag above for her. I wanted to create a back pack that was both elegant and practical for her. I lined the inside with a waterproof quilted fabric since I know she always likes to carry a water bottle with her. I added a deep exterior pocket for things she might need easy access to such as keys or a cell phone. I plan to carry a backpack design in my shop soon! The tapestry purse above is for another dear friend. The happy kitty purse will be available in the shop tonight. The purse above is made from a gorgeous fabric designed by Iman. Yes, the lovely super model and David Bowie's wife. I was not able to resist this fantastic print. It will also be available in the Pesky Cat Designs shop tonight! There's a new purse in the shop made from a certified organic cotton floral print from the P. Kaufmann line of sustainable upholstery fabrics produced in partnership with the Nature Conservancy. This 100% certified organic cotton upholstery fabric is piece dyed using ecological dyes. P/K Conserves contributes five percent of the product sales to the Nature Conservancy to support the worldwide conservation efforts they make everyday. You can read more about this line of fabrics at P/K Conserves website. While we are on the topic of organic, less than a week ago I planted some organic, non-GMO wheatgrass seeds and they sprouted very nicely. Our kitty Anni always had a supply of wheatgrass from the farmer's market when I lived in NYC. I couldn't find any here so I decided to grow it myself. She's been happily munching on it ever since! I recently added a couple of bags to the Pesky Cat Designs shop made from a cool whimsical owl print cotton canvas. I love the retro-look of this fabric. These owls are bound to brighten up your outfit and day! This year's fashion trend of color blocking has really caught my eye. It combines the use of two or more blocks of color in one item or in an ensemble. This morning I got inspired to create a bag design using this latest trend. I rushed off to my studio and several hours later the Two Tone Jewel Cut Purse emerged. 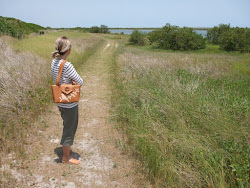 I've got more ideas for color block purses so I can't wait to get back to the studio! If you click above you can watch a short film about the history of Harris Tweed wool. It's an amazing cloth! Inspired by an ocean wave and a sand dollar spotted on the seashore. Five new bags made from Harris Tweed wool in shades of blue have been added to the Pesky Cat Designs shop. There's a selection in a weave of gray, blue and light brown, a heathered blue and a deep ocean blue. They are all fully lined in pretty cotton floral print fabrics. Earlier today I pedaled along the beach and watched birds enjoying the sea. Wishing everyone a wonderful weekend! As we all know, the top designers already have their fall collections created, photographed and on the runway. So I'm a little behind. I just started work on my upcoming Harris Tweed Fall Collection this past week. I did make my selections, order fabric and receive my tweed from Scotland a while back. I went for two themes, water and earth. It was so difficult choosing. I wish I could afford to order every color/pattern available. Or at least have a shop nearby so I could purchase whatever inspires me at any given moment. It's hard to think of wool with temperatures in the 90's here. Even a dip in the pool is not that refreshing right now since the water is luke warm from the sun beating on it all day. But if I want to have a nice selection of bags in the shop by September, work must begin now. So for the next month you will be able to find me in my air-conditioned studio with piles of gorgeous tweed being transformed into handbags. waiting to to be photographed and listed in the Pesky Cat Designs shop. They can be worn around your waist, on your shoulder or used as a clutch. A detachable and adjustable strap is included. Coming to the shop later today! A new design is coming to the Pesky Cat Designs shop. It's a generously sized hip bag with an adjustable and detachable strap/belt. It can be worn around your waist, on your shoulder or detach the strap and use it as a clutch. It has a zippered closure to keep your valuables safe and one small interior slip pocket. The adjustable strap/belt fits most waist sizes but a custom size can be requested. A couple of hip bags will be available in the shop this Sunday with more colors and fabric selections coming next week. Wishing everyone here in the states a Happy 4th of July and everyone a wonderful weekend! Last week I received a shipment of faux leather that I selected after reviewing several swatches that were sent to me from my supplier. This faux leather is pvc-free and has a really nice textured surface. Since moving to Florida from NYC I do not have the same access to fabrics shops so I depend on online sources a lot more. I always request swatches first before ordering. I love perusing my samples while imagining what they will be transformed into. 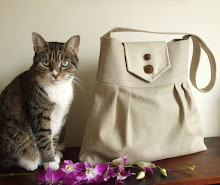 To see the new bags and my entire collection, come visit the Pesky Cat Designs shop!